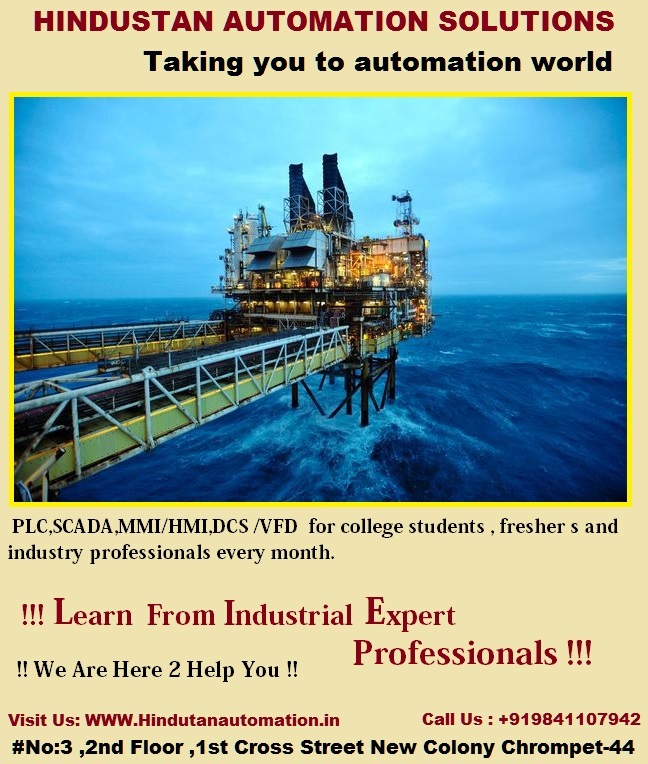 PLC - SCADA PROJECT TRAINING IN CHENNAI CHROMPET : BEST SUMMER PLC | SCADA TRAINING INSTITUTE :Call@ 9841107942, 044-42833433. OMRON Programmable Controller CJ1 series is small and applicable controller for everything from machine to process control with high flexibility. The model provides all the functions to the process control. The flexible system configuration makes it easy for a backplane-free structure installation. The CJ1 series offers intelligence for a fast and flexible solution for expanding the world of machine control. This is a versatile unit with upgraded basic functions. OMRON Programmable Controller CJ1 measured at only 90mm in height and 65mm in depth making it a super compact programmable controller that can be installed even in the narrow space in a machine serves as a control panel. Its high flexibility is suitable for any applications ranging from small device and temperature control to the more complex and large scale control over networks. To suit to your need, OMRON Programmable Controller CJ1 offer various types of CPU units for different applications. As your reference, here we reviewed the detail information about OMRON Programmable Controllers CJ1 Series. CJ1 OMRON Programmable Controller series comes with different CPU unit. The basic smallest, fast and flexible is the model with CJ1M-CPU1. It provides the similar compact dimensions with high-speed control performance and high-speed processing units. The model supports up to 128 MB of high-capacity memory cards for system and settings backup or log customer data. The second variant of OMRON Programmable Controller is the SYSMAC CJ-Series CPU Unit with Ethernet Unit functionality. The model has similar capability to the CJ1M-CPU1. The third variant is the CJ1m-CPU2. This is a compact and application-oriented controller with standard I/O feature for high potential. The CJ1 series come with the CJ1W-PA / PD power supply units. The power supply has already integrated with the RUN output for checking the operation status. For easier maintenance, the power supply has already equipped with replacement notifications. The power supply unit is up to 25 W and with wide variations 100 to 240 V AC or 24 V DC. There are many selections of I/O units. The CJ1W-ID/IA is for the high-speed input for various applications. The CJ1W-OC/OA/OD is the Output Units for CJ/NJ controller with wide range of basic output units for high-speed output and different application. For a Mixed I/O Units users can select the CJ1W-MD. Furthermore, there are also the Interrupt Input Units (CJ1W-INT01), Quick-Response Input Units (CJ1W-IDP01) and Interface Unit (CJ1W-B7A). 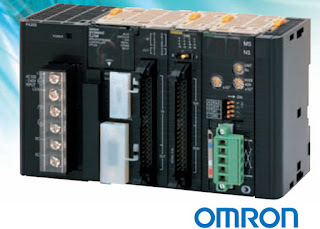 In addition to the Basic I/O units, OMRON provides Special I/O Units for further applications. The available Special I/O Units is ranging from CompoNet Master Unit, Process Analog I/O Unit, Temperature Control Unit, Position Control Unit and many more. The CPU Bus Units handle special I/O and communication needs to reach advanced motion control, network communications and position control. There is available wide range of CPU Bus Units to choose suiting to different applications. Through the CJ1W-IC/II, users can expand the CJ-series Controller capacity even when the space is limited. It comes with easy-to-use connectors that enable quick expansion without any tricky settings. The CJ1-series OMRON Programmable Controller is ideal for applications in the small space in a machine. With flexibility to integrate the controllers to the I/O, CPU Bus, Special I/O and extending mounted rack, making you can easily achieve the most advanced process controlling within your manufacturing process. 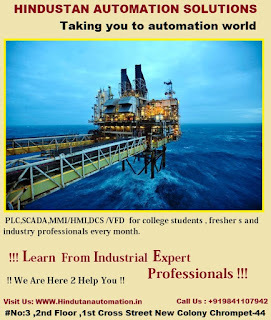 BEST SUMMER PLC | SCADA TRAINING INSTITUTE :Call@ 9841107942, 044-42833433. In the industrial technology, we had known about the sophisticated technology produced. There are many sophisticated technology then make it best of the best use. So the user will be satisfied about their equipment. But in the back side of the sophisticated equipment we used, there is the difference between industrial automation and process control. We had already heard about the industrial automation, but we should know that besides the industrial automation, there is process control. So, we should know both depth. The difference between industrial automation and process control is begun with our knowledge about industrial automation. It is very familiar because we had known it as the main role of a current equipment we use, especially for a computer. Industrial automation is also called as the controlling system of an industrial machine, it can be used for supporting the machine of the computer and also the robotic machine. The industrial automation cover the component of control system. It is also cover all the machinery and also the software system of the machine. So the all mechanism of the machine controlled well. Besides, there are many advantages of using the industrial automation in the technological world. They are high in the productivity, create the high quality of the product, the high flexibility, giving the accurate information, and also giving the best safety for the users. Process control is also like the industrial automation. But it is closer with the engineer system and also the algorhytms system of the machine. 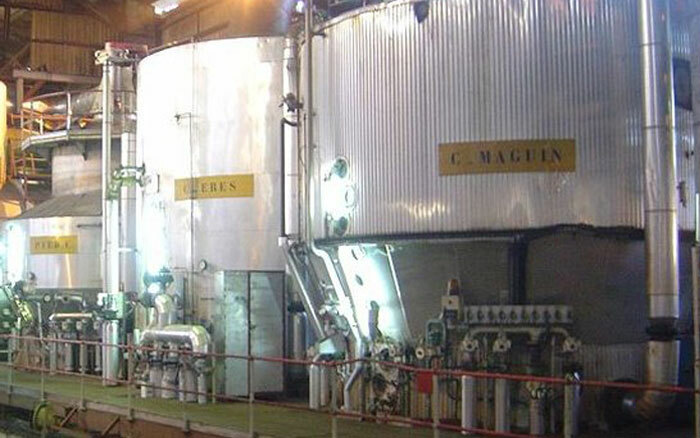 It is related also with the chemical reactor of the product we used. 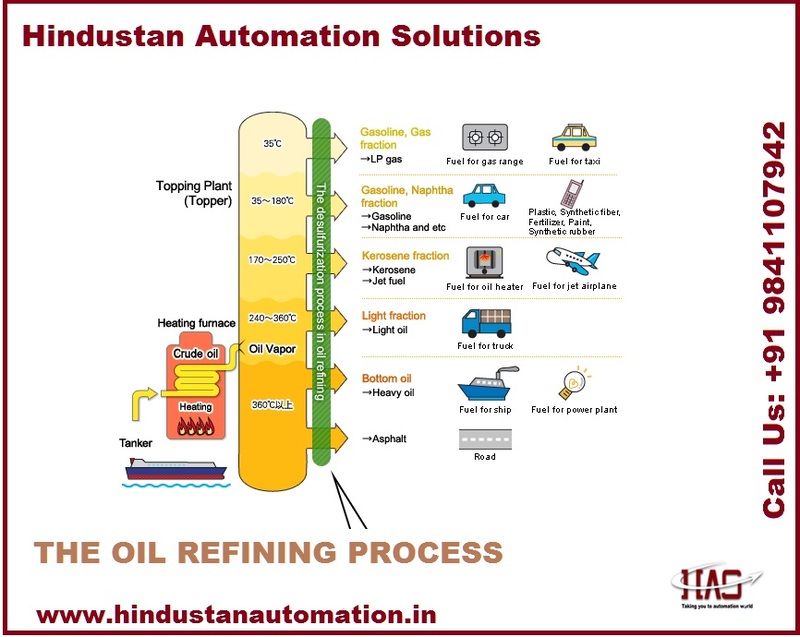 The difference between industrial automation and process control is that the process control also enables for the automation in the small range. While the industrial automation can be sued for the large range. There are three types of the process controls, they are discrete, batch, and continuous. Those all have the best correlation to each other for supporting the use of the equipment. Actually the difference between industrial automation and process control is about the range of the use. Both are very important component for the technological world. The industrial automation can be used for the large range of the technological industry. While for the process control is related with the small range. 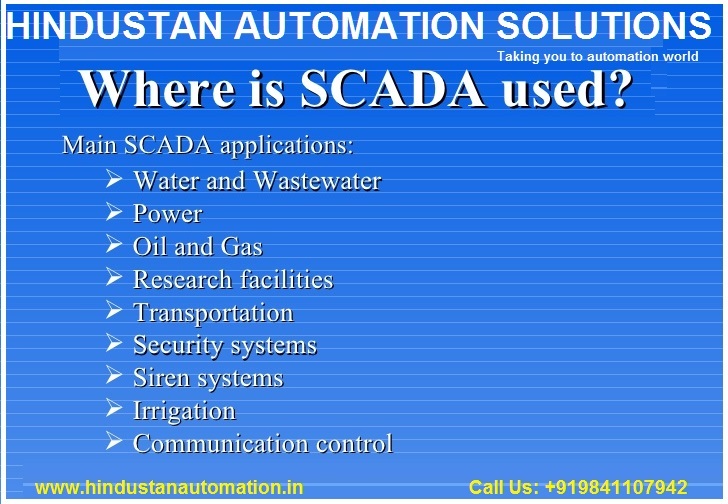 Scada Control and Supervision systems are used to monitor and control of plant or equipment in industries such as telecommunications, water, waste control, energy, oil and gas and transportation. 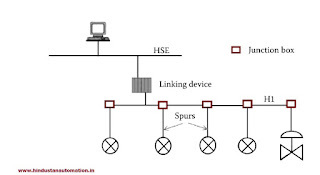 SCADA collects information system, such as happened to a leak in a pipeline, transferring information to a central site, alerting the home station that the leak occurred, to analyze the required control, etc. SCADA systems can be relatively simple, such as monitor the environmental conditions of a small office building or very complex systems, such as a system to monitor all activity in the nuclear power plant or water device activity in the city. 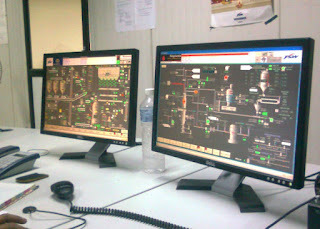 Element of Scada Control and Supervision Monitoring as unique solution to meet all these demands SCADA system. 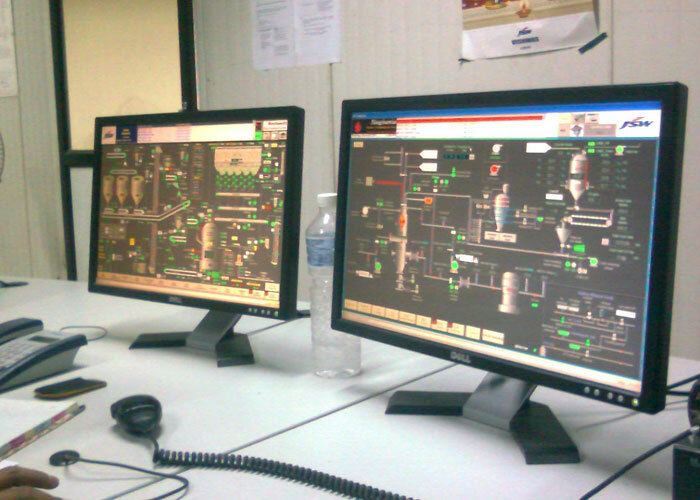 It is impossible to maintain Scada Control and Supervision of all industrial activities manually. Some mechanism necessary for the control and monitoring, data collection, data analysis and reporting tools generate. 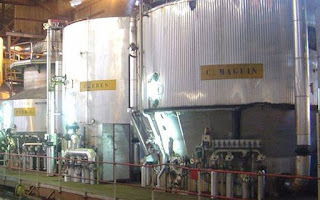 It presented a unique solution to meet all these demands SCADA system. This is the interface that provides a process for the human operator data, and through this, and human operators monitor and control the process. It collects data about the process and send commands (or control) of the process. Connected to the sensor in the process, converting sensor signals into digital data and send digital data monitoring system. They are used as organs area because it is more economical, versatile, flexible, and can be configured from the RTU private purposes. It provides connectivity with the control system and remote terminal unit. Central SCADA-range systems refers to monitor and control the entire site, or complex systems distributed over large areas (between industrial plants and country). This is performed more than control the work automatically by the unit and remote terminal (RTU) or a programmable logic control (PLC). Host control to enter the primary or basic functions of supervision is usually limited. For example, it is permissible for the PLC to control the cooling water flow through the part of the industrial process. But the system SCADA allows the operator to change the set points for the flow. Moreover, it also allows alarm conditions, for example the loss of high and flow temperature that will be recorded and displayed. SCADA already applies to the lowest level of automation. For example, the data collected by the sensors and measuring tools, asks settings. There are higher than this level, allows the system SCADA monitoring a predetermined value, and the inclusion of values and a set of other control interventions. In Today's world revolves around high technology & most companies have invested substantially in automated plants. For this reason most manufacturing companies are looking for competent engineers with basic aptitude towards automation and ability to work on varied brands of PLCs, Drives, MMI and SCADA. The usage of automation has increased more than tenfold in each industry for them to compete globally & the requirement for PLC, SCADA, MMI/HMI, DCS, trained engineers keep on increasing. We have been conducting training on various industrial automation tools such as PLC,SCADA,MMI/HMI,DCS for college students , fresher�s and industry professionals every month. We also provide tailor made training for specific areas of technology. In Today's world revolves around high technology & most companies have invested substantially in automated plants. For this reason most manufacturing companies are looking for competent engineers with basic aptitude towards automation and ability to work on varied brands of PLCs, Drives, MMI and SCADA. The usage of automation has increased more than tenfold in each industry for them to compete globally & the requirement for PLC, SCADA, MMI/HMI, DCS, trained engineers keep on increasing. 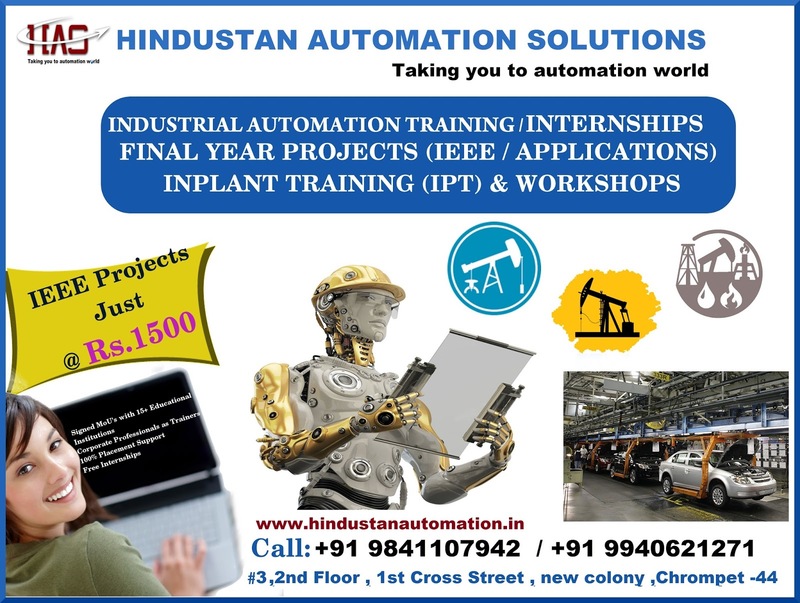 We have been conducting training on various industrial automation tools such as PLC,SCADA,MMI/HMI,DCS for college students , freshers and industry professionals every month. We also provide tailor made training for specific areas of technology. 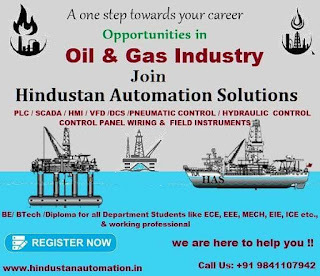 We have been conducting training on various industrial automation tools such as PLC,SCADA,MMI/HMI,DCS for college students , freshers and industry professionals every month. We also provide tailor made training for specific areas of technology. In Today's world revolves around high technology & most companies have invested substantially in automated plants. For this reason most manufacturing companies are looking for competent engineers with basic aptitude towards automation and ability to work on varied brands of PLCs, Drives, MMI and SCADA. The usage of automation has increased more than tenfold in each industry for them to compete globally & the requirement for PLC, SCADA, MMI/HMI, DCS, trained engineers keep on increasing. Omron Programmable Multi-Axis Controller is part of automation unit programming system to supports machine control. This controller enable to support the exchange of information easily with the host system includes. Omron one goal is to help manufacturers of high-speed motion control system developed for the construction of low cost. To achieve this, Omron and Delta Tau Data Systems, Inc. worked together as a team to improve the Omron Group advanced traffic control system and programmable logic controllers. By combining leading technology Delta Tau Data Systems global motion control, Omron ILO + S (logic, input, output, and security) can control technology to open new applications and solutions. Omron Programmable Multi-Axis Controller CK3E controller has been designed with the right multi-axis control. You can make capable system of controlling until up to 32 axes of motion and integrating allocated in the system control algorithms. Omron Programmable Multi-Axis Controller CK3E allows you to program in C language and the reuse of existing software assets. Compact design saves space in the panel and engine control. 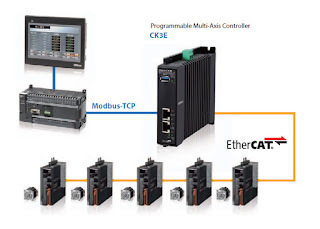 EtherCAT® connected to the servo drives, I / O, and other devices for CK3E, reducing the number of cables. Omron Programmable Multi-Axis Controller for EtherCAT, using shielded twisted-pair cable (double shield with a strip of aluminum and braiding) of the category 5 Ethernet (100BaseTX) or higher, and use cable respectively. Ethernet and specifications required for cable varies depending on the baud rate of communications. Omron Programmable Multi-Axis Controller as support tool program will help in the completion of PLC programming tasks special I / O module arrangements and access to an integrated network began. Peripheral devices such as adapters and cables are also available. OMRON programmable HMIS station is easy to use. It also provides representational power, network compatibility, strong and control links to support facilities and production machines. Omron Programmable Multi-Axis Controller is easy to use and also available to deal with the flexibility of applications from small equipment size to the entire production lines combining with any types such as CJ1, CS1 and other series. Omron Programmable Multi-Axis Controller help manufacturers to simplify process with high-speed motion control system for the construction of low cost. 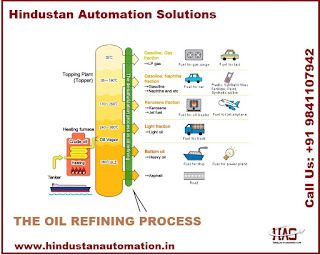 The company has been offering industrial automation/process automation, since its inception. 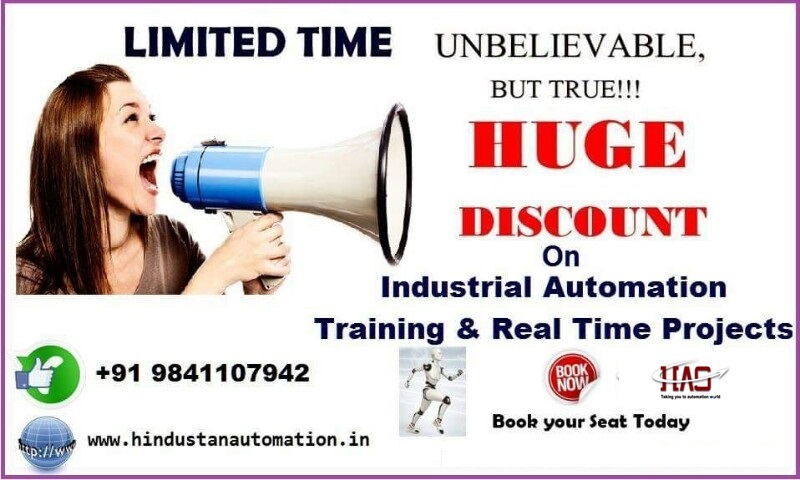 We also provide trained manpower in PLC automation and after sales services to several industries at nominal charges. Apart from this, our centre in Chennai offers excellent training for engineering students, industry professionals, and freshers. 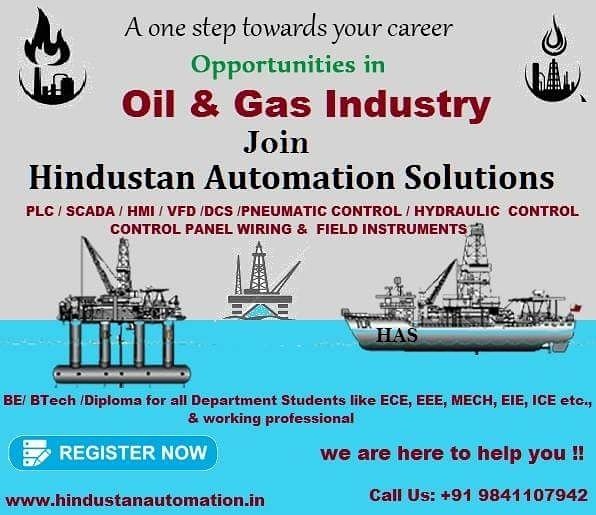 We also conduct courses in the field of PLC & SCADA which are extremely useful for companies interested in automation trainings to update the skills of their technical persons, students undergoing summer training, working professionals engaged in project/maintenance/production/design/application engineering departments. Topology involves the manner in which the ˉeldbus devices are connected to the data highway. There are several possible topologies that are employed as per the needs of the plant geography. Several options employed are as follows: point-to-point, bus with spurs (multidrop), tree or chicken foot, daisy chain, and mixed. For clarity, power supply and terminators are not shown in the Below Figures representing different fieldbus technologies. 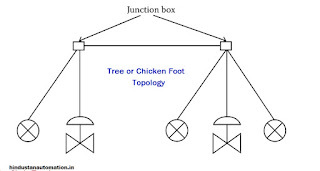 Foot Topology In this topology, devices on a particular segment are connected via a junction box, marshaling panel, terminal, or I/O card (also called chicken foot). This scheme is suitable for devices situated in the same geographical place and can be connected to the same junction box and also obeying the rules of maximum spur length per segment. The scheme is shown in Below Figure. This is shown in Below Figure in which the devices are series connected in a particular segment. Device connections to the segment should be such that dis-connection of a single segment would not lead to total isolation of that segment. A mixed topology embraces more than one topology discussed above, and a possible combination is shown in Below Figure. 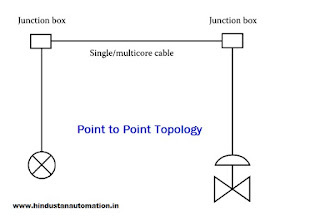 Depending on the physical locations of the devices in the plant and the length restrictions for segment lengths, different topologies are employed to derive the advantages of individual topologies. SCADA systems for electric power industry support the effective networking system in the automation world. 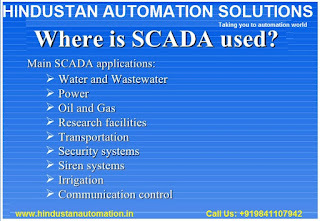 SCADA is as the important thing in the automation industry, especially for monitoring the system walked, is being the best system for making thee automation industry developed well. In fact, the existence of the SCADA system had already made the technological industry developed fast with its sophisticated approach. The users feel easier to use their sophisticated gadget. Then the SCADA systems for electric power industry itself are the new revolution of the SCADA's function. The main function of the SCADA systems for electric power industry is to integrate and also prove the qualified function. SCADA is as the controller will be faster and better application because the capabilities are increased. Related with the function of the SCADA that can be used for the communication side. 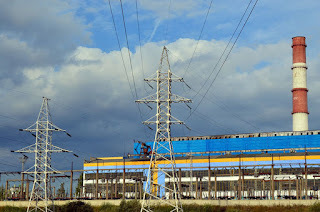 SCADA systems for electric power industry also provide the unlimited communication. The function range of the SCADA for this electronic system is available for internal and also external enterprise. This SCADA system increases the power capacity of the electric system. We need the electric power in everyday. Almost all of our activity uses the electricity and the main activity used the electricity is using other computer. So we need the efficient component that will make our computer save and filled the enough electricity. The market size. The big market of the worldwide that use the main function of the computer technology is becoming the main factor that support the high demand and also the high existence of the SCADA system. SCADA systems for electric power industry are the best solution for having the renewable energy for having the best needed of the electricity power. It had already used in some big countries, like north America, USA, Latin American, European, Middle East, Africa, and also Asia. Siemens Basic Controllers make the Industrial development was come to the bright era. There are so many product has been created and produced several kind of industries. From the fine product until techno goods and stuff has become the output of the industries and manufacture plants. On the one side it was a good idea for humanity where a lot human interest and activities could help and do with easy way. But on the other side, it was something challenging which had to handle by the industries and people inside the industries itself. What the challenging vision by ? The challenging its how to created and produce anything in simple, easier, faster and reliable and at the same time save for the people who work with it. As the answer, Siemens Basic Controllers as part of automation solution become an ideal system and suitable mainly to apply with bigger industries and industrial manufacture plants. Using Siemens Basic Controllers, the business become growth and bigger, and as the same time it want more and more better technology. It happen too at the industrial fields, and also the automation solution market. There are lots of industries and people who involved with, want better and greater idea of automation solution aspect. Due to the fact, Siemens as one of world class automatio solution manufacture created Siemens Basic Controllers called SIMATIC S7-1200. Here in this articke we would go further more with an the information and benefits of SIMATIC S7-1200 Siemens Basic Controllers. 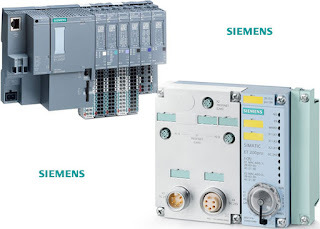 Siemens Basic Controllers is Totally Integrated Automation Portal. It was remarkably known as an integrated synchronize portal through many controllers. It was sommonly working as the HMI synchronized based with several high level or motion machinery which is need an output about the enggine or machine working status. Sometimes it need high cost to operated, but the SIMATIC S7-1200 has been support an scalable automation solution which can running more with better low cost level and highly operating system diagnostic, those system that can bring efficiency and accuracy in operating supported system. In the aspect of dimension and size, this Siemens Basic Controllers has been designed completelly save space in control cabinet. Intgrated PROFINET or Ethernet port with the modular bort concept. Other that to be better way in case of SIMATIC S7-1200 was the removable conectors. It can be happen as the impact of the design that used interchangeability conector which placed at the upper side of the CPU’s. All of those great aspect has been designed as the simply idea of compact IOs, compact and save spacing design. SIMATIC S7-1200 Siemens Basic Controllers was kindly known as control cabinet save space, and Integrated TIA which can be synchronized with SIMATIC panel. It was great choice for whom looking for better idea in case of industrial basic controllers. Due to the fact, this model can be put at the better way for brighter industrial basic controllers rather than other types. Siemens Software Controller supports a lot of developing models of machine and so with the Industrial Automation Solution, in case of hardware or any machinery vulnerabilities. Developing models of industrial automation solution was something that should be happen, because of the industrial intention and purpose. On the other hands, the developing of the models of the hardware and so with the machinery construction need to be supported by the better software controller in which that can be suitable for any special machines. By the time, the industries has been developed the models of Siemens Software Controller, followed by development of machine design. 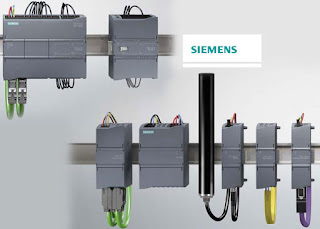 Siemens, one of the biggest manufacture named in the industries of industrial automation solution has been developed lot of the automation solution stuff to answers the industries challenge. 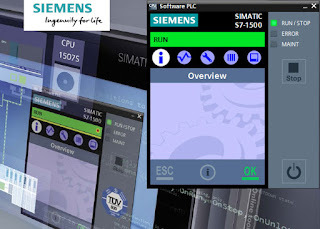 And due to the fact since the first time Siemens has included the PC based controller inside the offering of the SIMATIC Siemens Software Controller portofolio. This article would come up more as SIMATIC S7-1500 Siemens Software-Controller review. Long time ago, when the machine with the automation solution such as Siemens Software Controller has been running out by the industries which is used and operated, the problem come from when do at the multi tasking operating process. Siemens comes to bring better problem solve idea with kind of software controller so the program still running while doing other process for example, to carry out the updating of the windows of the industrial PC platform while the systems running well. Otherwise this Siemens Software Controller could doing access protection as great as running out the interfaces and positioning axes for PROFINET and or PROFIBUS. That capabilities of Siemens Software Controller was come by several intelegence code and vers which is created by the Siemens Lab team. It was totally designed by special machine that taken and controlled by PC Based. This Siemens software-controller has been designed to give the industrial users several capabilities such as; functions that integrated with analogous systems for Advanced Controllers SIMATIC S7-1500, user-specific integration functions through open interfaces such as Matlab/C++, connection that could be more integrated with any BUS systems or IT server. More than that, the Siemens software-controller has been created and designed to bring other user kindly function such as; PC Software integrational aspect, for example Image Processing, eased communication which is can do multi functional in singgle device. Otherwise this was designed to work with highly complex algorithm in the control program,which was great to integrated with based of the software development such as SimLink or Matlab. By that idea, this Siemens software-controller can do the process during the Windows failure, or reboot when the main platform doing the Updates. On the side of the software processed and mainly platform operation, this Siemens software-controller had capacity to doing the efficieny in engginering aspect. It was included several abilities such as; integration with high level languages user program, also the interfacesrealizationwith ODK 1500SPC applications. By that aspect this software controller has been design as the IPC Product Range IPC scalability. There are a lot of software controller that produce by other software house or manufacture. But Siemens software controller become one of new controller generation that available for PC Based automation controller. This capabalities can give several benefits such as TIA (Totally Integrated Automation) Portal capabilites as well as the maximum user friendliness. Siemens Distributed Controllers is solution for efficiency space of controller today. By the time there are such a lot of Industries which used the many model of Automation solution in field of mechanism and machineries. It was something that challenging the manufacture of automation solution to create and made better design controller for the PLC’s parts. It wasn’t only created better and smalest design also with high capapaties and modular capabilites. In range of high mechanism manufacture series, industries was need a better distributed controllers. One of manufacture which made high guarantee and with upper level of capabilities of Siemens. In case of that Siemens has been developed the Siemens Distributed Controllers, which separated in several parts and models, at least there are three models distributed controllers that developed by Siemens, there was SIMATIC ET 200 SP CPU, SIMATIC ET 200 SP Open Controller, and also SIMATIC ET 200 Pro CPU. Every Siemens Distributed Controller has been developed by the design of the expert in distributed controller for automation solution purposes. Here in this article we would go further more with product overview and information to found a better vision of each of the Siemens Distributed Controllers product instalation. Every Siemens Distributed Controllers product has become a corporate identity, and also with the Siemens Distributed Controller that was design by the Siemens Expert in automation solution. As the consequences the product must become true fine product, it is something that Siemens has to be. Here are the product beneficial act and also information of each distribute controller stuff. For whom that in search of Siemens Distributed Controllers device which made in small size but can operated in high performance level, this SIMATIC ET 200 SP CPU has been an answer. It was because this device can be operated with the similiar function as the CPU 1511 / CPU 1513 which operated with S7-1500 controller system. This models has been great to handle several function such as fully symbolic programming, web server, integrated system diagnostics, integrated security, also integrated trace function. Siemens Distributed Controllers was come with three integrated ethernet ports and 2 ethernet conection which had cost saving features that comes fromflexibly selected means of bus adapters. Are tired of looking for better Siemens Distributed Controllers that would be used for better PC Based software controller that running with visualization output? This compact distributed called SIMATIC ET 200 SP Open Controller from Siemens could grantly true answer. It was because this distributed controller stuff was design to operated in ambient of temperature around 60°C, 64 module in single line expansion, and user friendly design which used PROFINET Onboard, or replaceable bus adapter that can bring flexi conection aspect of Siemens Distributed Controllers. It is something suitable of Siemens Distributed Controllers product for whom that need powerfull, rugged and compact device model. Called the rugged, tought because of the standard which bring by this models that protected with IP65/67 standard. More than powerfull it was also functional, with interfaces model CPU to connection of PROFINET or PROFIBUS. Siemens Distributed Controller was kind of device that developed by Siemens automation solution expert in that comes with compact design. It is something solution for manufacture who looking for distributed controller that can accomodate small boxes directly.